What Is the Book Value of an Asset? If you are discussing business assets and liabilities with your accountant or banker, you may have heard the phrase "book value of an asset." Looking at your business, you see many business assets that have a book value. 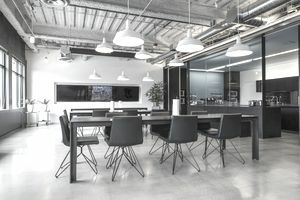 For example, in the photo, the conference table and chairs, office furniture, big screen TV, and computers all have a book value. The book value of an asset is the value of that asset on the "books" (the accounting books and the balance sheet) of the company. It's important to note that the book value is not necessarily the same as the fair market value (the amount the asset could be sold for on the open market). Book value is strictly an accounting and tax calculation. The book value of a company, which is the value of all the company's assets minus its liabilities. The book value of shareholder's equity, which is the value of a shareholder's account minus any liabilities shared by the shareholder. How is Book Value Calculated? Book value is calculated on property assets that can be depreciated. Depreciable assets have a lasting value, such as furniture, equipment, and other personal property of a business. Book value also is shown for buildings. The calculation of book value for an asset is the original cost of the asset minus the accumulated depreciation to the date of the report. All three of these amounts are shown on the business balance sheet, for all depreciated assets. After the initial purchase of an asset, there is no accumulated depreciation yet, so the book value is the cost. Then, as time goes on, the cost stays the same, but the accumulated depreciation increases, so the book value decreases. At some point, the book value may only represent salvage or scrap value, after all the depreciation has been taken. At that point, the asset is considered to be "off the books." That doesn't mean the asset must be scrapped or that the asset doesn't have value to the company. It just means that the asset has no value (or only scrap/salvage value) on the balance sheet. Do All Business Assets Have a Book Value? While all business assets have a book value, that value is only calculated for property assets, like equipment, vehicles, and furniture and fixtures. Land is not depreciated because it doesn't lose value over time. Other assets, like cash and accounts receivable, are not depreciated, so the book value is the actual cost of the item. How Is Book Value Included on a Balance Sheet? The net Property, Plant, and Equipment is the total book value of all of these assets. Do Personal Assets Have a Book Value? You could certainly calculate the book value of a personal asset, like a car. But this calculation would not be very meaningful since an individual can't take depreciation on assets. Why is Book Value Important for Business Finances? The book value of a company is important for accounting purposes, and it's part of the review of the business if the business is to be sold. Since book value isn't related to the market value of an individual asset, it can be used as a reference point, but not as a selling price. Why is Book Value Important for Business Taxes? The book value of assets for tax purposes is important mostly because of the depreciation of those assets. Depreciation is an expense, which is shown in the business profit and loss statement, and depreciation lowers profits and thus reduces business taxes.